Last month three variants of the Tab Pro line became available at some retailers in the United States: Tab Pro 8.4, Tab Pro 10.1 and Note Pro 12.2. Also at that time the information said that Tab Pro 12.2 wouldn’t be available until somewhere in March. 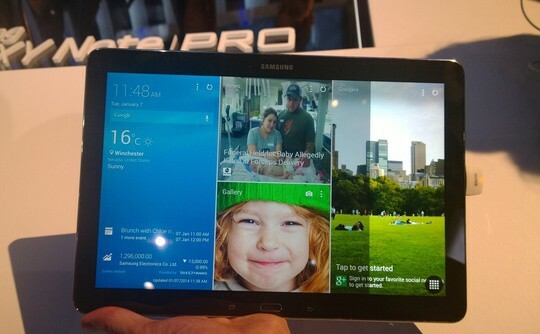 Samsung officials declared today that the Samsung Tab Pro 12.2 tablet will be available in select stores from March 9th. You could find it in: Samsung Store, Best Buy, Amazon, NewEgg, Walmart and several others. The 32 GB storage variant of Tab Pro 12.2 will cost $649.99. This is not a cheap price, but what do you get for it? The CPU of Tab Pro 12.2 is a 2.3 GHz Snapdragon 800 with an Adreno 330 GPU. It has 3 GB of RAM. The display is a 12.2 inch one with at 2560×1600 resolution. The device will have a 8 MP back camera and a 2 MP front one. It will have two models: a 32 GB and a 64 GB, both of them with microSD slot card. The battery will be a 9500 mAh. The best part of it is that Samsung promised up to $800 of free premium apps to make it worth more. So maybe if you buy a Tab Pro 12.2 you will get the best deal out there. We think that this model from the Tab Pro line is quite an interesting one and we will definitely buy one.